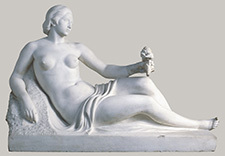 In addition to being a great collector, Frederic Marès was a well-known sculptor. His work can be found on the streets and in the public squares of Barcelona, but it can also be admired here in his Library-Studio where the display includes some of his sculptures which were donated to the museum in 1988. This marble statue is a study of the main figure in the monument dedicated to Francesc Soler i Rovirosa. It was through this work that Marès established himself as a public sculptor. He received the support of the artistic world, and the monument went on to form a part of the city's commemorative sculptural history. The monument is a tribute to Catalan set designer Francesc Soler i Rovirosa, who died in 1900 and who played an important role in the rebirth of Spanish scenic design. The city's artistic institutions commissioned this project from Frederic Marès without holding any sort of competition. The piece was paid for with public money and Marès was given complete thematic freedom. These details give us an idea of the prestige the sculptor was already enjoying at the time. Three years later, the sculpture was unveiled in the gardens then known as the Reina Victoria, on the Gran Via de les Corts Catalanas in Barcelona. The work is quite simple-there is a pedestal with a medallion featuring a likeness of Soler i Rovirosa. On top of this rests the figure of a woman holding a rose. She seems to be offering the flower to the artist, representing triumph and immortality. The figure's calm, classical lines represent the attributes of the noucentista woman. From a formal standpoint, its style moves away from the traditional standards observed in commemorative monuments, pushing the person being honored to a secondary plane (in this case, within the confines of the medallion). It is the allegorical figure which demonstrates his well-known work as an artist. Notice that in this same hall there are several versions of this piece in a variety of materials.